Here are some of our favorite homemade ice cream, frozen yogurt and sorbet recipes we have tried using the Cuisinart ICE-21 Ice Cream Maker (our review). You can of course flavor this vanilla base anyway you like. We have made strawberry, chocolate, mocha, peppermint, butter pecan, etc.. You can also add mix-ins, like chocolate chips, chopped nuts, candies, shredded coconut, etc., once the ice cream gets to a soft consistency toward the end of churning. If you add mix-ins too early (when the base is still more of a liquid), then they will not get distributed well throughout the ice cream so wait until just before it’s done churning to add them. 1 tablespoon real vanilla extract (don’t you even use that fake stuff!). Or to make it extra special, use a vanilla bean pod – just cut it in half, scrape the insides out with a knife and add it & the whole pod to your mix (take the pod out later when making the ice cream). First make sure you have put the Cuisinart freezer bowl into the freezer for at least 16 hours. Depending how cold your freezer gets, it may take up to 24 hours. You can tell if it’s ready by shaking the bowl – if you don’t feel any liquid sloshing around, they it’s frozen and ready to go. Combine the milk, sugar and salt in a bowl until the sugar dissolves. Cover and refrigerate for at least an hour, but you can leave overnight to make the flavors meld and develop more. Go get your freezer bowl, paddle and cover and then immediately pour the vanilla mixture into the ice cream maker. Let it work its magic for 15-20 minutes, until the ice cream is almost pouring out the top. N0w enjoy soft-serve or put it in the freezer for 1-2 hours for hard ice cream or eat some now, save some for later! And for even more indulgence, don’t forget to add some homemade Magic Shell topping too! We like to add mashed strawberries as opposed to sliced or whole strawberries so that the strawberries flavor the ice cream base more intensely and you don’t have big chunks of icy fruit. In a medium bowl, whisk together the cocoa, sugars, and salt. Add the milk and combine using a whisk or hand mixer on low speed until the cocoa, sugars, and salt are dissolved. Continue with step 3 in directions for vanilla ice cream recipe. 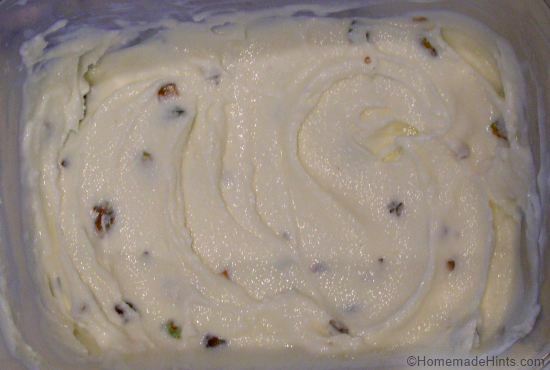 We usually make buttered pecan ice cream, but we had plenty of pistachios and no pecans so I made buttered pistachio ice cream and it was just as awesome. Likewise, choose any nut you like and replace it in this recipe. 1 cup nuts* (your choice) – We usually start with unroasted, unsalted raw nuts, but I used roasted and salted pistachios and it came out great – just don’t brown them as long in the first step – just warm them up enough in the pan to coat with the butter. We were out of pecans, so this time we made buttered pistachio ice cream. Melt the butter in a medium skillet. Add the nts and 1 teaspoon of salt (if using unsalted butter). Cook over medium heat until the pecans are toasted and golden (unless they are already roasted), stirring frequently, about 6-8 minutes. Remove from heat, and let return to room temperature. Some like to drain the butter off the nuts, but I just add the entire mixture to the ice cream and it gives it a great taste. Your choice. But don’t throw the butter out, just save it for your toast or for pancakes, melted for popcorn etc..
Go get your freezer bowl, paddle and cover and then immediately pour the base mixture into the ice cream maker. Let the mixture thicken for about 15 minutes, then add the pecans during the last 5 minutes of churning. N0w enjoy soft-serve or put it in the freezer for 1-2 hours for hard ice cream or eat some now, save some for later! One of our favorite ice cream recipes is Homemade Cheesecake Ice Cream, but we added it as a stand-alone post since this page was getting too long and there was so much to say about it. Just follow the link to get the recipe. We have been searching for a heavy cream brand in our grocery stores that don’t have either carrageenan, mono and diglycerides or polysorbate 80 and it isn’t easy. Why is that stuff in the heavy cream? As thickeners, stabilizers and emulsifiers Next time you go to the store, just look how many heavy cream products have one or both of those ingredients. Our best bet here locally is to buy unhomogenized milk from the local daily and then skim off the cream, but it isn’t that easy to just get the pure cream. We need a little more practice. We have tried using half and half instead of the milk and heavy cream combination and it comes out alright as soft-serve, but is kind of on the icy-side once frozen. 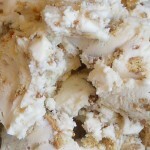 I recently made the buttered pecan ice cream recipe with 2 cups of half and half, 1/2 cup of Greek non-fat yogurt and 1/2 cup of sweetened condensed milk (I subsequently reduced the amount of sugar to 1/4 cup instead of 3/4 cup) and the combination was much better – not icy and more like the semi-soft texture of ice cream when it’s frozen. Next I will try the same combination, but use 1 cup of Greek yogurt and eliminate the sweetened condensed milk*. 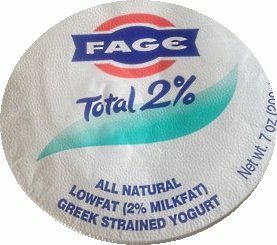 I want to try with different fat combinations of Greek yogurt such as 2% or full-fat whole milk yogurt too. *I recently made a dark-chocolate, toasted-almond base with 2 cups half and half and 1 cup non-fat Greek yogurt and the ice cream consistency came out great, much better than just half and half alone or even with the added sweetened condensed milk. I think this will be my favorite “healthy” ice cream recipe alternative to using heavy cream since the non-fat yogurt saves on some calories and fat. You can make custard ice cream which is more richer and creamier in texture. The main difference is the addition of egg yolks. This reminds me of Kohr’s Frozen Custard I used to get when I was a child on the boardwalk in Seaside Heights or Point Pleasant, New Jersey. Glad I can make my own since I now live far away from “The Shaw” (that’s the shore in Joisey :-)). In a medium saucepan set over medium-low heat, whisk together the milk, cream, half of the sugar, salt and the scraped vanilla bean (including the pod). Bring the mixture just to a boil. Once the milk/cream mixture has come to a slight boil, whisk about 1/3 of the hot mixture into the yolk/sugar mixture. This is to “temper” the egg yolks so they won’t get heated to high and curdle. Add another 1/3 of the mixture, then return the combined mixture to the saucepan. Using a wooden spoon, stir the mixture constantly over low heat until it thickens slightly and coats the back of the spoon. This mixture mus NOT boil or the yolks will overcook – the process should only take a few minutes. Pour the mixture through a fine mesh strainer (discard the vanilla pod) and bring to room temperature. Stir in the vanilla extract. Cover and refrigerate 1-2 hours, or overnight. Turn on the Cuisinart Ice Cream Maker; pour the mixture into the frozen freezer bowl and let mix until thickened, about 20 minutes. Then eat soft-serve or freeze for ~2 hrs for hard-serve. As with the vanilla ice cream base, you can change the vanilla custard base into chocolate, strawberry, pistachio, etc.. by adding your favorite flavorings. 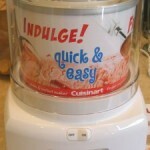 I have made frozen yogurt with fat-free, full fat and low fat Greek-style yogurt. I have also made it with regular yogurt strained and unstrained. 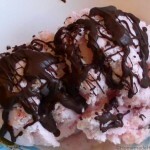 I think the best frozen yogurt recipes have been with Greek yogurt either using low-fat or full-fat versions. Not to say we didn’t like the recipes made with regular yogurt or fat-free Greek yogurt – they were all good, but the creamiest tasting one’s were those Greek yogurts with at least some fat. You will also find that the lower-fat versions are more icier than creamy in texture. I just buy the Greek yogurt instead of straining the regular yogurt to save time, but if you rather save some money by purchasing regular yogurt, you could then strain it at home to make it thicker and get pretty much the same result. Healthy side note: The live and active cultures (i.e. L. acidophilus) in yogurt becomes inactive when frozen, but reactivated when eaten from your own body heat so probiotics are another added health benefit to eating frozen yogurt over ice cream. However, keep in mind if you heat your base mixture containing yogurt, you will kill the live cultures. Mix all the ingredients and chill in the refrigerator for 1-2 hours. 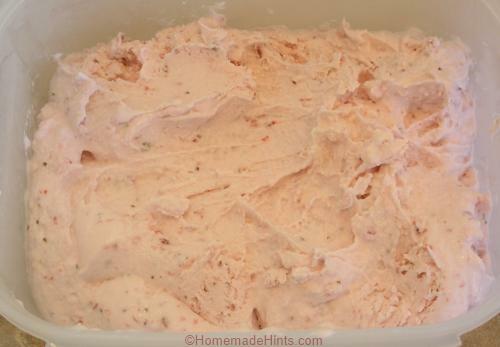 Pour into the ice cream maker and churn until thickened, 15-20 minutes. Eat immediately as soft-serve or freeze for 1-2 hours for hard serve*. We grow lots of basil so decided to give this one a try. The basil flavor is actually very subtle, more of a background flavor. I imagine that lemon-thyme would be a nice swap for the basil as well. 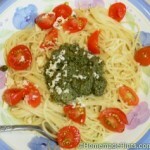 The original recipe is just for lemon-basil, but I decided to add some strawberries too. Prepare a lemon simply syrup with the water, sugar and 1 1/2 tablespoons of the lemon zest by combining all three in a medium saucepan set over medium-low heat. Cook mixture until the sugar is fully dissolved. Remove from heat. Once the simply syrup is ready, add the basil and salt. Let the mixture steep for 30 minutes. Strain the chilled mixture through a fine mesh strainer. Add the lemon juice and strawberries; mix well to combine. Cover and refrigerate the mix at least 2-3 hours. Turn on the Cuisinart Ice Cream Maker; pour the mixture into the frozen freezer bowl and let mix until thickened, about 15-20 minutes. 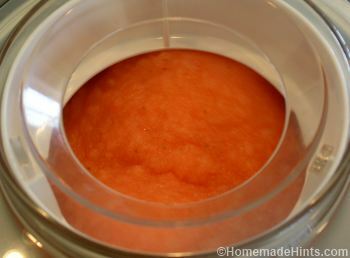 A few minutes before the sorbet is done, add the reserved zest and let churn until combined. 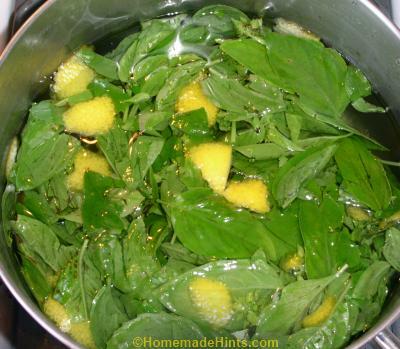 You can play around with the basil, lemon juice and strawberry ratios to get the kind of flavor you like most. Of course you could substitute other fruit for the strawberries such as blackberries or raspberries. The sorbet becomes a little hard when frozen, so it is best when left out for 10 minutes or so before eating. What are your favorite ice cream, frozen yogurt or sorbet flavors that you have made? Any good recipes for a chocolate ice cream? Sioux – I added a “Simple Chocolate Ice Cream Recipe” just below the “Basic Vanilla” recipe above in the post. Oooo la la…That mocha ice cream you have pictured is exactly what we’ve been looking for. We make our own ice cream too, and kahlua (sp) is one of our faves, as is chocolate espresso. It could be that your mocha is similar, but it’s a lot lighter looking than our chocolate espresso — I think it looks better — I think ours is too chocolatey. My hope is to make our own version of my all-time favorite flavor (but one that I cannot readily find at any ice cream shop): Mocha Fudge. Thanks for any info you might be willing to share! !